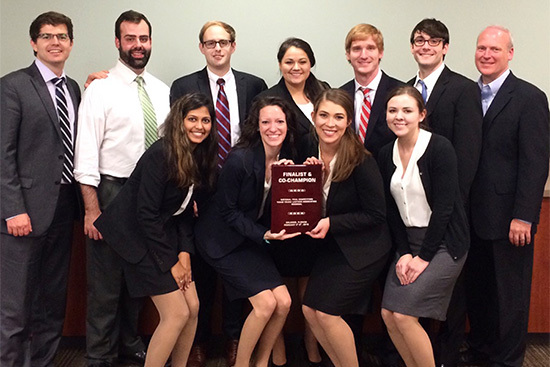 The two student teams from Samford University’s Cumberland School of Law have achieved success in a recent trial competition. The third-year team of Paige Duncan, Max Smith, Spenser Templeton and Matt Woodham won the recent southeastern regional trial competition in Orlando, Florida. They were ranked first in preliminary rounds of the competition and had wins over Florida A&M University College of Law, Stetson University College of Law, Faulkner University Jones School of Law and Barry University Dwayne O. Andreas School of Law. Woodham was awarded best closing argument for his prosecution case, receiving three perfect scores. One judge remarked that it was the first time she had ever given a perfect score. The team will compete in the national finals March 11 in Houston, Texas. The second team, which includes second-year students Stewart Alvis, Hope Beaton, Collin Hatcher, Amanda Herren and Priyanka Patel, reached the semifinals of the regional competition, defeating teams from University of Florida Levin School of Law and St. Thomas University School of Law. The two Cumberland teams are coached by Judge Jim Roberts (’94) and Ross Massey (’11).